Most early Kankakee River settlers trapped, hunted, farmed and logged. All of these activities required a means to get their product to market. The river met most of those needs. The problem was that the Kankakee was a rather slow and cantankerous waterway. Steamboats solved this predicament. It is reported that the fist steamboat to ply the Kankakee was in around 1874. A sawmill in Willvale, LaPorte County had a contract to supply railroad ties for the Pittsburgh, Fort Wayne & Chicago Railroad. Getting the logs to the sawmill was not a problem, but transporting the ties to the railroad station in Davies, Indiana was difficult. Sol Gordon of Hebron came up with a solution. 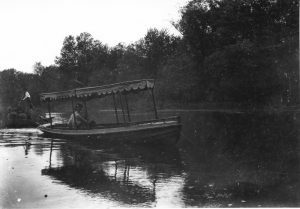 He built a flatboat and Del Kellogg of Valparaiso installed a paddlewheel steam engine to propel the boat. It worked and the ties were delivered but not without issues. A better vessel was needed to provide a more reliable means to move timber. A few years later Kellogg and Gordon constructed an improved steamboat. They planned to transport cordwood— which had little value in the vicinity of their headquarters located at Baum’s Bridge— to Momence where there was a market for the cordwood. At that time wood was the primary fuel for most steam engines used along the Kankakee River. Years later, coal would become the main fuel for steam engines. Momence was a center for sawmills and other steam-driven industries. Gordon built a 35 by 9-foot boat. Del Kellogg and his father Denis supplied and installed the engine, boiler and other necessary fittings to power the boat. The Kelloggs’ owned a iron foundry on W. Indiana Avenue in Valparaiso. Gordon built two additional barges to carry the wood. Jerry Sherwood and Frank Ritt of Hebron cut the trees down and floated the logs to the dock where they were loaded on the barges. Sherwood with his vast knowledge of the river from trapping and hunting it was hired as the pilot. The maiden voyage consisted of a shipment of 75 cords of wood. The plan needed some tweaking—towing the barges was not working. The men cut poles and pushed the barges instead. A day and a half later they delivered the first load to Momence. For much of the year the Kankakee River was too shallow to use as a dependable transportation means. 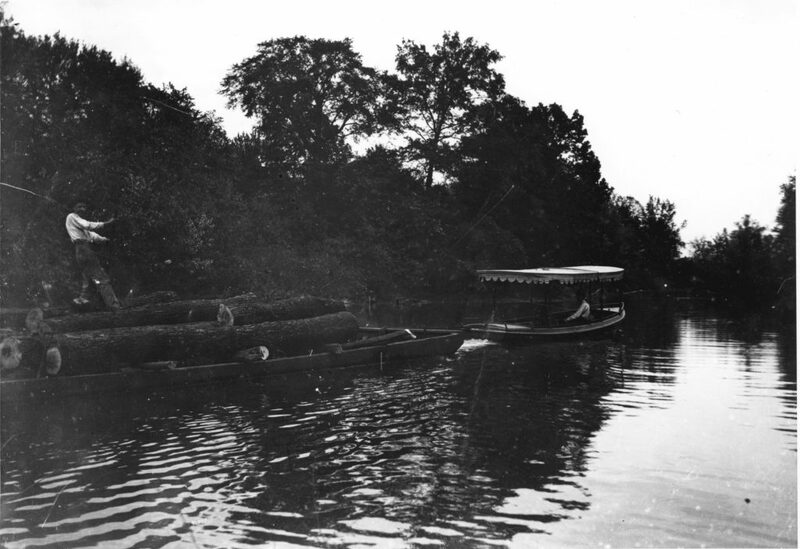 Additionally, in order to get the logs to the barges the marshes needed to be high enough to float the timber to the loading dock. Being enterprising men, Kellogg, Gordon and Sherwood hired out their steamboat to hunters during the low-water season. The business was very successful until the Monon Railroad built a low bridge across the Kankakee near Shelby which severely restricted river traffic. The Kankakee was often felt to be an unreliable transportation system. The initial reason given to drain and channelize the marsh was for improved transportation. Kellogg proved that it could be profitability used as was! In my next column I will tell you the very interesting story of what happened to the steam engine after the steamboat was broken-up.